Receiving a parcel that has been tampered with can be so frustrating, especially when the contents inside are missing or damaged! From a retailer’s perspective, parcel tampering can affect brand reputation and generate extra costs associated with replacing lost or broken items. The way your parcel is handled after leaving your warehouse may be harder to control, but there are a few things you can do to minimise the risk of theft and tampering. Below are five tamper-evident packaging solutions to help you ensure your products are well-protected on the way to customers. 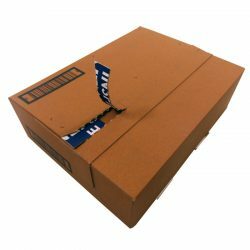 Boxes with a built-in tear strip are perfect for identifying if someone has interfered with your shipments as they cannot be reattached after being removed! And there’s an additional benefit… your customers won’t need to use scissors or any other tools to open their parcels – they can simply pull away the strip. If you worry about counterfeits, consider bringing your brand inside your packaging – for example, you can print your logo or a custom message on the inner flap of your box. This will help detract potential thieves while ensuring your parcels surprise and delight your customers upon opening. These two tapes provide clear evidence if someone has tampered with your parcels, as they cannot be reapplied without noticing! If the tamper-evident tape is removed from the package, a “void open” message will appear on the surface! This high-performance tape creates a permanent seal with your box, making your entire parcels stronger and more secure. This helps prevent tampering and reduces costs associated with replacing broken or lost products. Postal packaging solutions with a fitted self-seal strip are difficult to tamper with. The adhesive can only be used once and leaves a clear mark on the pack surface after removal. Any attempts to reseal the package with tape or glue will make it clear that someone interfered with your parcel before it reached your customers. If you would like to find out more about protecting your parcels from tampering, contact Macfarlane Packaging today.